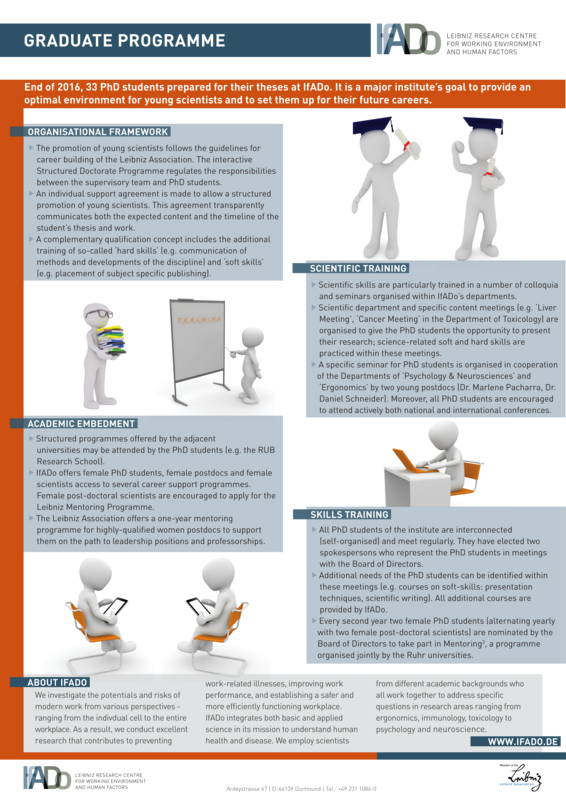 The promotion of young scientists follows the guidelines for career building of the Leibniz Association. The interactive Structured Doctorate Programme (founded in 2011 as an intranet-based working platform) regulates the responsibilities between the supervisory team and PhD students. An individual support agreement is made to allow a structured promotion of young scientists. This agreement transparently communicates both the expected content and the timeline of the student’s thesis and work. A complementary qualification concept (see items 2 – 4) includes the additional training of so-called ‘hard skills’ (e.g. communication of methods and developments of the discipline, application and implementation perspectives) and ‘soft skills’ (e.g. placement of subject specific publishing, presentation techniques, didactic and media skills, writing grant proposals and project management and career planning). Scientific skills are particularly trained in a number of colloquia and seminars organised within IfADo’s departments. Furthermore, scientific department and specific content meetings (e.g. ‘Liver Meeting’, ‘Cancer Meeting’ in the Department of Toxicology) are organised to give the PhD students the opportunity to present their research; science-related soft and hard skills are practiced within these meetings. A specific seminar for PhD students is organised in cooperation of the Departments of ‘Psychology & Neurosciences’ and ‘Ergonomics’ by two young postdocs (Dr. Marlene Pacharra, Dr. Daniel Schneider). Moreover, all PhD students are encouraged to attend actively both national and international conferences. All PhD students of the institute are interconnected (self-organised) and meet regularly. They have elected two spokespersons who represent the PhD students in meetings with the Board of Directors. Additional needs of the PhD students can be identified within these meetings (e.g. courses on soft-skills: presentation techniques, scientific writing). All additional courses are provided by IfADo. Every second year two female PhD students (alternating yearly with two female post-doctoral scientists) are nominated by the Board of Directors to take part in Mentoring3, a programme organised jointly by the Ruhr universities (‘UA Ruhr’ – Ruhr-Universität Bochum, TU Dortmund, Universität Duisburg-Essen). Furthermore, female post-doctoral scientists are encouraged to apply for the Leibniz Mentoring Programme.